Researchers have developed a way to use commercial inkjet printers and readily available ink to print hidden images that are only visible when illuminated with appropriately polarized waves in the terahertz region of the electromagnetic spectrum. The inexpensive method could be used as a type of invisible ink to hide information in otherwise normal-looking images, making it possible to distinguish between authentic and counterfeit items, for example. "We used silver and carbon ink to print an image consisting of small rods that are about a millimeter long and a couple of hundred microns wide," said Ajay Nahata from the University of Utah, leader of the research team. "We found that changing the fraction of silver and carbon in each rod changes the conductivity in each rod just slightly, but visually, you can't see this modification. Passing terahertz radiation at the correct frequency and polarization through the array allows extraction of information encoded into the conductivity." 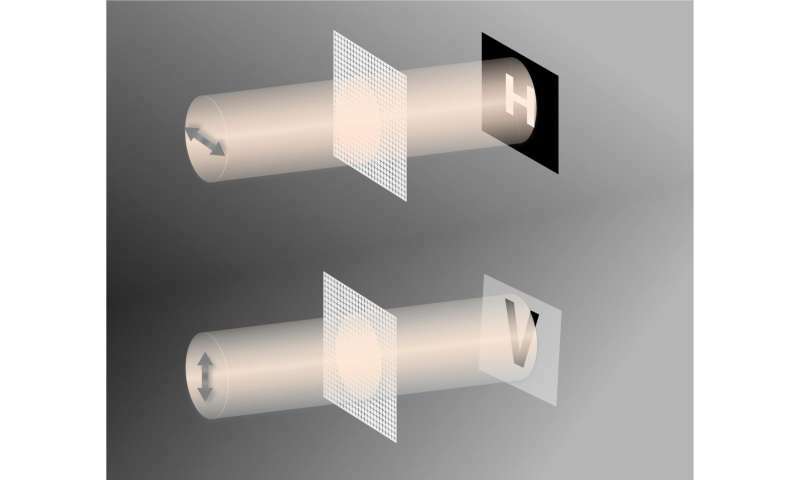 In The Optical Society's journal for high impact research, Optica, the researchers demonstrated their new method to hide image information in an array of printed rods that all look nearly identical. They used the technique to conceal both grayscale and 64-color QR codes, and even embedded two QR codes into a single image, with each code viewable using a different polarization. To the naked eye the images look like an array of identical looking lines, but when viewed with terahertz radiation, the embedded QR code image becomes apparent. "Our very easy-to-use method can print complex patterns of rods with varying conductivity," said Nahata. "This cannot easily be done even using a multimillion dollar nanofabrication facility. An added benefit to our technique is that it can performed very inexpensively." The new technique allows printing of different shapes that form a type of metamaterial - synthetic materials that exhibit properties that don't usually exist in nature. Although there is a great deal of interest in manipulating metamaterials to better control the propagation of light, most techniques require expensive lithography equipment found in nanofabrication facilities to pattern the material in a way that produces desired properties. Nahata and his colleagues previously developed a simple method to use an off-the-shelf inkjet printer to apply inks made with silver and carbon, which can be purchased from specialty stores online. They wanted to see if their ink-jet printing technique could create various conductivities, a parameter that is typically difficult to modify because it requires changing the type of metal applied at each spatial location. To do this using standard lithography would be time consuming and expensive because each metal would have to be applied in a separate process. "As we were printing these rods we saw that, in many cases, we couldn't visually tell the difference between different conductivities," said Nahata. "That led to the idea of using this to encode an image without the need for standard encryption approaches." To see if they could use the method to encode information, the researchers printed three types of QR codes, each 72 by 72 pixels. For one QR code they used arrays of rods to create nine different conductivities, each coding for one gray level. When they imaged this QR code with terahertz illumination, only 2.7 percent of the rods gave values that were different from what was designed. The researchers also used rods printed in a cross formation to create two separate QR codes that could each be read with a different polarization of terahertz radiation. The team then created a color QR code by using non-overlapping rods of three different lengths to create each pixel. Each pixel in the image contained the same pattern of rods but varied in conductivity. By arranging the rods in a way that minimized errors, the researchers created three overlapping QR codes corresponding to RGB color channels. Because each pixel contained four different conductivities that could each correspond to a color, a total of 64 colors was observed in the final image. The researchers said they could likely achieve even more than 64 colors with improvements in the printing process. "We have created the capability to fabricate structures that can have adjacent cells, or pixels, with very different conductivities and shown that the conductivity can be read with high fidelity," said Nahata. "That means that when we print a QR code, we see the QR code and not any blurring or bleeding of colors." With the very inexpensive (under $60) printers used in the paper, the technique can produce images with a resolution of about 100 microns. With somewhat more expensive but still commercially available printers, 20-micron resolution should be achievable. Although the researchers used QR codes that are relatively simple and small, the technique could be used to embed information into more complex and detailed images using a larger canvas. Nahata's team used terahertz radiation to read the coded information because the wavelengths in this region are best suited for imaging the resolution available from commercial inkjet printers. The researchers are now working to expand their technique so the images can be interrogated with visible, rather than terahertz, wavelengths. This challenging endeavor will require the researchers to build new printers that can produce smaller rods to form images with higher resolutions. The researchers are also exploring the possibility of developing additional capabilities that could make the embedded information even more secure. For example, they could make inks that might have to be heated or exposed to light of a certain wavelength before the information would be visible using the appropriate terahertz radiation.